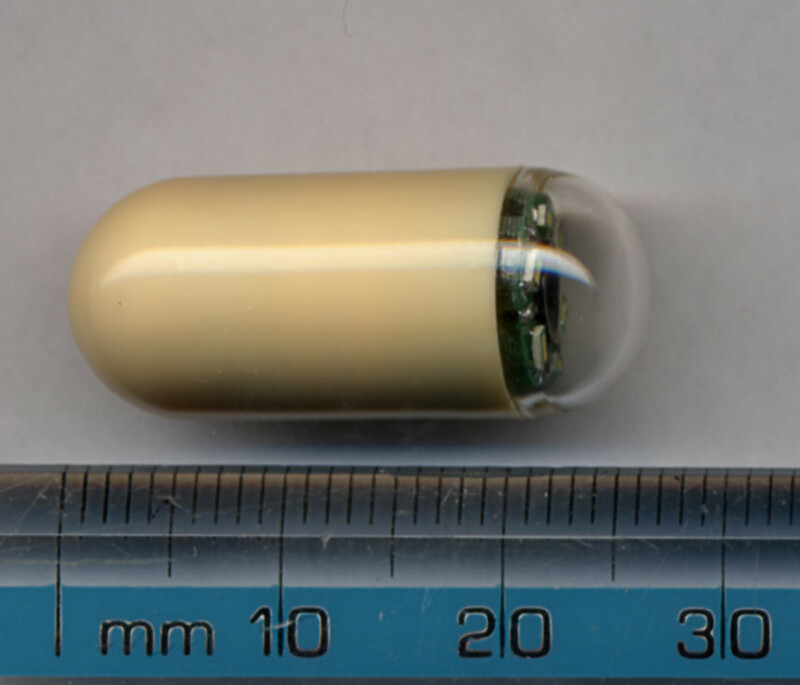 In capsule endoscopy, you swallow a pill-shaped camera (PillCam) that then travels through your gut and makes pictures of your small intestine (1). A capsule camera is 28 mm (about an inch) long and 11 mm wide. It has a slippery coating when wet to ease swallowing a bit. The cost of the camera and procedure is about $500 (without insurance). Capsule endoscopy may be done when small bowel disease like celiac or Crohn’s disease or bowel bleeding that cannot be detected by upper endoscopy or colonoscopy is suspected. Capsule endoscopy can be done in a patient after 10 years of age (2), including pregnant women (3). In days before the test you will have an appointment with your gastroenterologist to discuss about your symptoms, gastrointestinal diseases and surgeries you have had so far, eventual allergies and medications you are taking. You will probably need to discontinue some medications for some time before and during the test. You will need to fast completely (not eat and drink) for 12 hours before the start of the test. You will get a belt with a recorder to wear it around your waist. You will swallow a camera that will enter your bowel and take over 50,000 pictures of the inside layer (mucosa) of your small intestine. Pictures will be continuously sending via wireless route (radio waves) to the recorder for 8 hours. You will not be allowed to run or exercise during this time but you will be able to freely walk around. Two hours after swallowing the camera, you will be allowed to start to drink and after four hours to eat. When the camera will enter the large intestine it will still take some time (12 to 72 hours but usually within 24 hours after swallowing) to be excreted with the stool. You will not need to return a camera to the doctor. Complications of capsule endoscopy are rare; camera can get stuck in the bowel, usually due to fibrous tissue (adhesions) from past bowel inflammation or surgery. If fever, bloating, vomiting, chest or abdominal pain or cramps appear during the test you need to inform the doctor immediately. Recorded images will be uploaded on the computer, and a video will be made from them and studied by the doctor. You can expect to get results in a week or so. Pillcams for endoscopy of the esophagus and the colon also exist. Some disorders discovered during capsule endoscopy, like small bleeding or a polyp can be treated by another small intestinal endoscopic procedure – double balloon endoscopy (enteroscopy) .